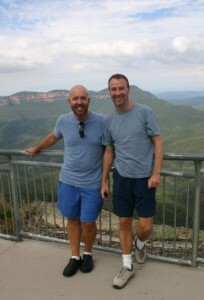 Up early – we are heading to see the Blue Mountains, a 90 minute drive west of Sydney. Eric has lent us his car for the day, and he arrives at our place to drop it off just after 9, and of course there is a hamper for our morning coffee break sitting on the back seat. Again, his generosity leaves us speechless. We head off, not needing maps to negotiate our way out of town – we feel like true Sydneysiders at this minor triumph. Traffic is easy this morning. We wonder whether the air will be blue today or not – the weather forecast for the Blue Mountains is a high of only 13, and the air is turned blue when the sun heats the eucalyptus trees and their oil evaporates. The Lonely Planet guidebook tells us of a scenic back road, and we turn off onto it, catching glimpses of beauty. We stop at a lookout, and craning over the trees, see a beautiful vista of the valley and the mountains. We spend some lovely minutes here, alone with the view. We realize that we will indeed see the famed blue air today. We continue our drive, and shortly after arrive at Echo Point, the main lookout, with spectacular views of the 3 Sisters and the canyon. 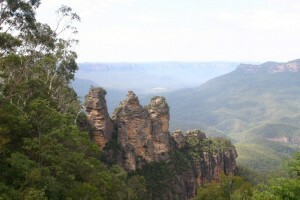 We continue the beauty-laced drive, eventually ending up in Katoomba, the main city of the Blue Mountains. We stop for lunch, and are just nicely seated in the restaurant when it starts to pour. It continues to pour through lunch, and we run back to the car through the rain. We vote to head back to Sydney. We make our way to Eric’s place for a pre-dinner cocktail, then we all head out to a wonderful hole-in-the-wall Eric knows, serving Japanese food, and crammed to the rafters with Japanese students studying at the nearby university. Then home to an early bed – we have to be up early on Saturday.